Brand new townhome. Welcome to luxury townhome living welcome to The Columbia! 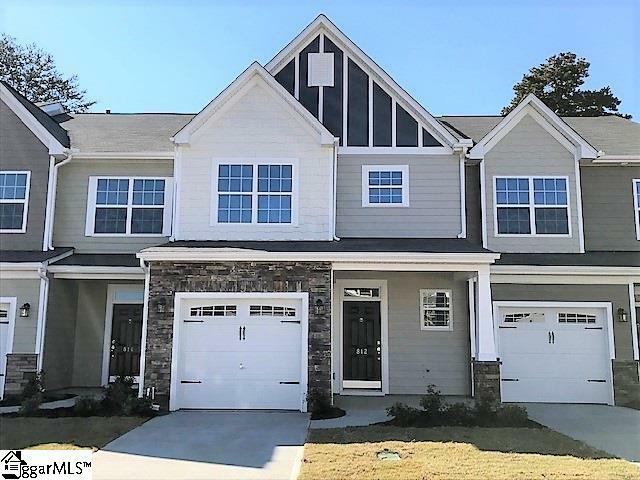 This townhome is located in our Village at Adams Mill community located off of HW 14 adjacent to the Simpsonville YMCA community center. The exterior of this home features a brick veneer. After coming through the front door you find yourself in the foyer with a powder room and drop zone/laundry room to your right and left. The remainder of the downstairs is wide open, composed of the kitchen, breakfast area, and family room complete with fireplace and back porch. The kitchen features a large, center island, granite countertops, upgraded cabinetry w/ crown molding, pendant lighting, ceramic tile backsplash, and stainless steel Kenmore appliances. This townhome also has an upgraded 8x10 patio size and the downstairs flooring is hardwood throughout! The upstairs layout featuring double master bedrooms definitely makes The Columbia a unique floor plan! As you move upstairs you have carpet flooring throughout with the exception of hall bathroom and master bathroom which have LVP! Both of the master bedrooms have a huge walk-in closet and master bathroom that is a 5-piece set complete with double master vanity and cultured marble countertops! In between the two master bedrooms is a quaint loft area perfect for light reading or relaxing. The Columbia is perfect for all buyers who prefer a home with lots of large living spaces! Come by and see it for yourself today!